Price unbundling is back in the news after its big splash during the recessionary times of 2008. Most people do not use the phrase “price unbundling” or “unbundled pricing” in their everyday vernacular nor do they use it label the trend. Customers and newsmedia call it, “nickel and diming” or “squeezing the customer for extras”. Before we go further definitions are in order. Unbundling is not the opposite of Bundling nor as the name implies undoing a bundle. Marketers deliberately introduce bundles for several reasons, I discussed a few of them here. Primary reason is customer perception of value. 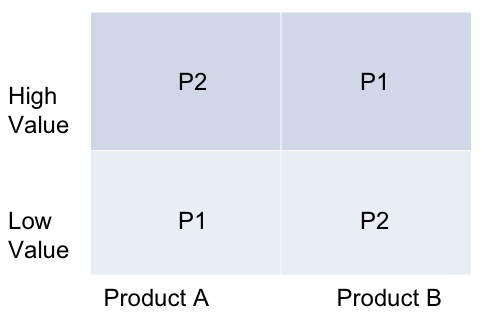 Take a sample case of two products A and B and two customers P1 and P2. Bundling of A and B delivers better profit when P1 and P2’s value perception of A and B are reversed. Before the bundling A and B were valued albeit differently by customers. Unbundling is not the case of reversing the decision the previous decision to bundle A and B.
Unbundling is breaking down a product or service that was perceived as a monolith and charging for parts that used to be included. Marketers did not start with two or more products that each had a customer demand, value and price. A required condition for unbundling is the component that is being unbundled must be truly optional – selling left and right shoe separately is not unbundling. So why didn’t the marketers start out by pricing separately for the included components? Either the components were not separately consumed. Likely no one wants to eat airline food without traveling in one as well. Even if they could be, the marketer had a different source of revenue that delivered higher profit than charging for the extra.This is the case of bank debit cards, banks were able to charge the merchants an interchange fee. It was easier for banks to drive up debit card adoption and usage by including it for free as part of the “whole” because each transaction brought revenue from the merchants. The product price is inflexible due to regulations, competition or other reasons. For instance they can’t increase the price without drop in demand that will adversely affect profit. The other source of revenue dried up as in the case of debit cards. The new regulations severely cut the merchant fee and banks are stuck with a service they adds value to customers but nothing to the banks. We should not lose sight of the fact that these extras do add value to customers and are truly optional (as I stated above). Since the marketers chose not to do value signal and not to charge for it, the reference price for these extras are stuck at $0 in the minds of customers. It was their past sins – giving away more than what the customer wanted or rewarding one side with value gained through other sources – that leads marketers to unbundling. When the marketers, airlines and banks, try to charge for this value-add without focusing on the customer reference price they face extreme backlash. Any price higher than the reference price will be seen the customer as unfair. It is especially hard when the reference price is $0. So how can a marketer roll out unbundling without customer backlash? Maintain reference price of components even when they are included with the whole. Take the case of amazon free shipping for purchases over $25. Amazon always lists the shipping cost and then subtracts it. If they neglected to do this step the next best option is to improve the reference price before charging for it. There are many ways, one of them is to use options and another is to use cost signaling. It is easier to not commit the original sin of including lot more than the customer wants and even if you did maintain the reference price. I saw a Groupon promotion from BlockBuster Express that gives away $5 worth kiosk movie rentals for $2. The deal, at the last check, had sold more than 25,000 Groupons. For more than one reason, many of which I explain in my book, this is a very good use of Groupon by BlockBuster and in general a very good use of price promotion for a product. Product: This is a basic utilitarian product that competes on price. Regular rentals go for $1. The rental choice is likely limited, only so many DVDs can be stocked in a kiosk. The rental period is also limited – just one night. This is a convenience product, something people hire when they run out of most options. It is by no means a premium product. Customer: There is no direct contact between the customer and customer service reps. It is a vending machine – as impersonal as it can get. There is no reason whatsoever to worry about customer experience and delighting customers. The customer mix and whether or not the new customers will fit the brand’s target segment is not a concern. Even without the promotion, customers choose this product for price not anything else. Costs: The costs are all sunk once BlockBuster decides to place one and stock it with DVDs. If there are DVDs sitting in it, they are not making money. The marginal cost is close to $0, (it is the opportunity cost of not serving a full priced customer). It makes sense to put these idle DVDs to work by encouraging rentals. Capacity: BlockBuster has many such kiosks and the offer is valid at any of them. So they are not risking over crowding in any one location. By the general rules of random distribution, we can assume that all kiosks will be utilized uniformly. This is a great improvement of capacity utilization of kiosks – making sure DVDs do not sit idle. Even if a kiosk runs out there are no downside risks – no customer backlash, customers either come back another day or move to next kiosk. Bring in new customers: BlockBuster is struggling to hold on to its current store customers, as more and more are switching to Netflix. On the low end they are behind Redbox rentals. They are new to the rental kiosk business. Before this Groupon promotion, many customers did not even know about BlockBuster Express and even if they did they may not stop to try it. A $2 for $5 deal is great way to bring them to the kiosk and create awareness. Repeat Customers: This is a convenience product, not a premium product. There is a specific job this product is hired for. So the logic of people falling in love with service etc do not apply here. Even if only very small percentage of these customers come back, it is a better option than any other available customer acquisition option. Groupon Fees: A brand like BlockBuster may have negotiated a better fee for Groupon than the usual 50% small businesses pay. Even if they did not, this is a good application of Groupon as a Marketing and Sales channel. Overall the price promotion aligns very well with the product and the target customer segment. What about your business and your product?